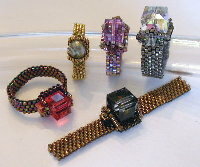 Judith likes her beadwork to be big, bold, and noticed! With a 10 mm faceted crystal cube this ring gets rave reviews. The cigar band shape of the peyote base is sturdy enough to support the large crystal cube, but narrows nicely to fit comfortably. Instructions included for a smaller versions using an 8mm cube or a 6mm pearl. Also a terrific way to showcase a small gemstone or artist bead too!